With non-violence at the forefront of KBEP’s mission, we celebrate Dr. Martin Luther King Jr’s vision for the world which we live in. As a nation, our remembrance of Dr. King’s work often ignores some of the core goals and values of his activism—among them, his commitment to anti-poverty work, labor organizing, and workers’ rights, issues he viewed as inextricable from his civil rights activism. In memoriam of all facets of the critical work Dr. King led to better our world, we encourage our brothers and sisters in violence prevention to treat today as a “Day On” rather than a day off. Instead of shopping or catching up on TV shows, spend time connecting with and loving on the people in your community. Do something that helps lift people up. Learn from someone. Choose to serve. Dr. John Silvanus Wilson, Jr., the former President of Morehouse College, which is Dr. King’s alma mater, and former head of President Obama’s White House Initiative on Historically Black Colleges and Universities. 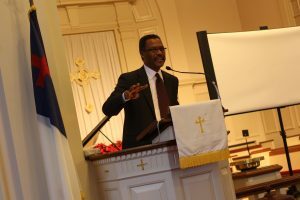 This weekend we were fortunate enough to attend a community celebration recognizing the life of Dr. Martin Luther King, Jr. at the Federated Church in Hyannis. We listened and heard Dr. John Silvanus Wilson, Jr., words about “unfinished symphonies” and changing the world one person at a time. We watched in amazement as brave 3rd graders spoke of their bold visions and solutions to our world’s most troubling problems. Today, Nwando Ofokansi, Adult Programs Coordinator at KBEP, will be speaking at the “Have Respect. Get Respect” Community Forum. This is one of many events surrounding the all weekend “Woonsocket MLK Jr. Weekend of 2019.” We encourage all to attend and participate. While great progress has been made in the decades since the civil rights movement, there is still much to be done to advance Martin Luther King Jr.’s legacy of anti-racism and labor activism. Let’s keep moving his mission forward. Start by lifting up and supporting your community today.